This week’s Biology theme was Animal Habitats. The Big Idea: During opening circle, we explained to kids that habitat meant home. We talked about the things we need for a comfortable home. Since it was a cold November day, the kids said that houses keep us warm and dry. We agreed that’s one purpose – but if you’re in a really hot place, we might need a shelter to keep us cool and shaded. We agreed it was important to have food in your home, and a comfy place to sleep. It’s also a handy place to stash your stuff that you don’t need right now, but will need in the future. Then we talked about what different animals need in their home. (For example, fish need water in their home!) You can use animal puppets – hold them up and ask the kids what would be a comfy home for that particular animal. Learning Activity: Bird Beak Adaptations. 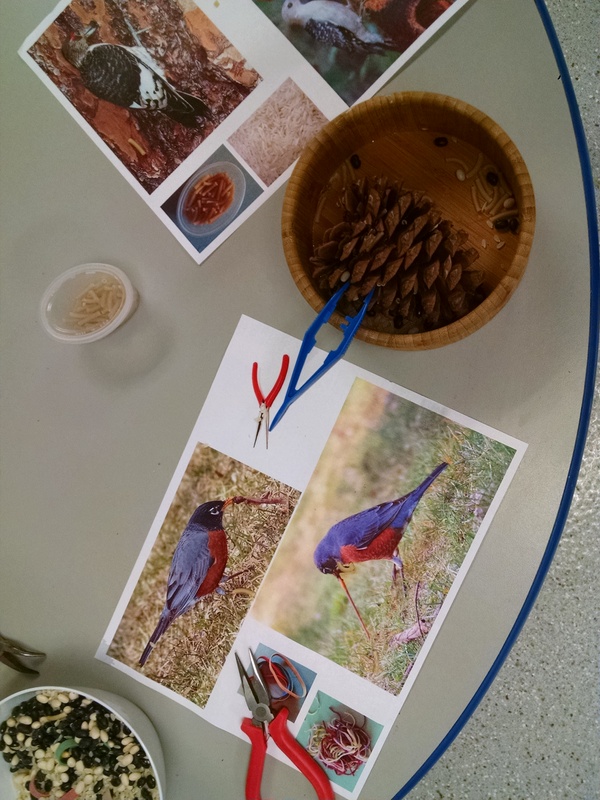 This activity was intended to help the kids learn about the different ways animals evolve to adapt to the food that’s available in their environment. We had five stations on a table, and I made posters to accompany the activity to illustrate the idea. (Print your own posters from this PDF.) We had a bottle of water and a pipette to represent how hummingbirds gather nectar, a nutcracker and plastic eggs to illustrate how a toucan cracks a nutshell (we used the plastic eggs because we’re a nut-free classroom), a pinecone with macaroni sprinkled into it and tweezers to show how a woodpecker could catch bugs in tree bark, rubber bands in a dish of rice and black beans to grab with needle nose pliers to represent a robin and a worm, and a fish tank net and plastic fish to show a pelican’s fish catching ability. 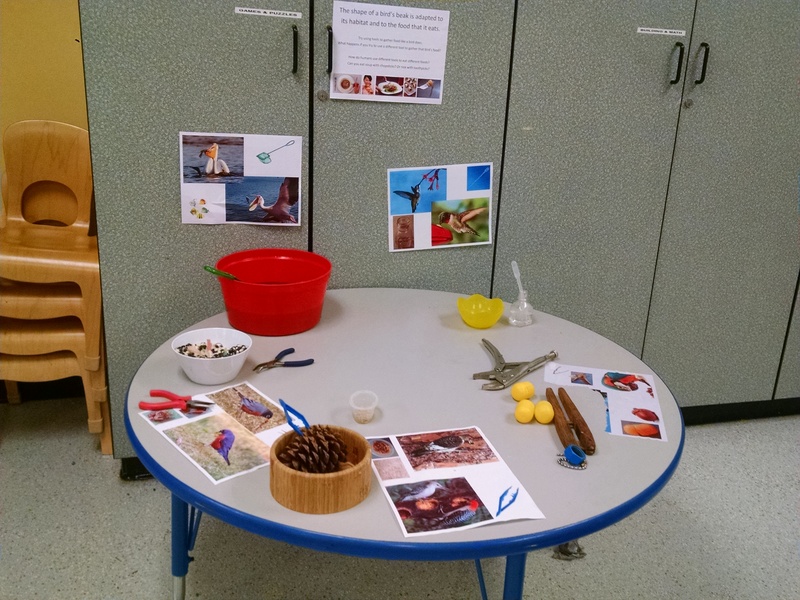 Kids were encouraged to try all the “right tools” with the right foods. (Great small motor and tool use practice.) And then try using them with the wrong things. Can a hummingbird crack open a nut? Never. Can a pelican catch bugs in the bark? Never. You could extend this activity into snack/lunch time by offering a variety of foods (soup, rice, noodles) and a variety of implements (spoon, chopsticks, fork) for them to try eating with. You could talk about how humans make tools based on what they see in nature that allow us to do a wide variety of activities and eat a wide variety of foods. Note: original idea came from a workshop based on the book Growing Up Wild. I’ve since discovered a book called Unbeatable Beaks that we’ll add in to the curriculum next year to support this activity. 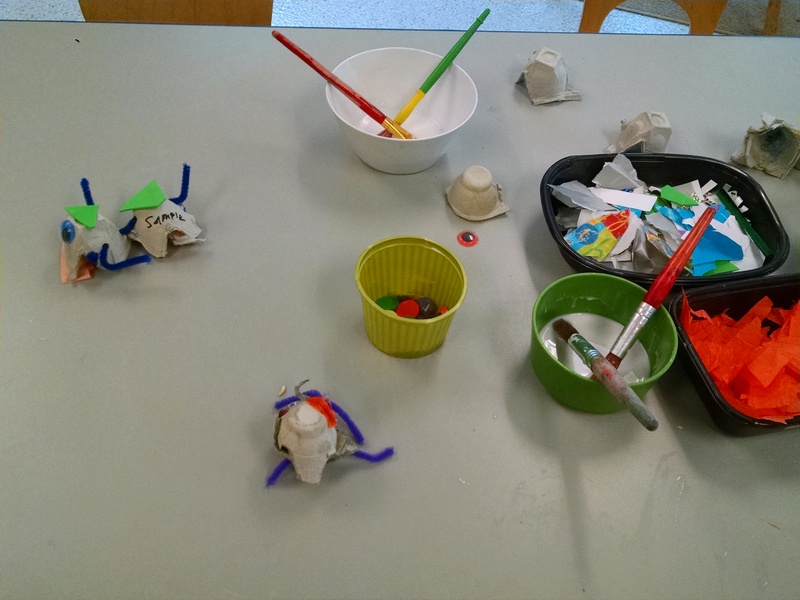 Make a creature: We had egg cartons, pipe cleaners, googly eyes and more so that children could create a small animal. Habitat collage: Then kids went to the collage station and used cardboard bases and recycled materials to build a habitat for their creatures. 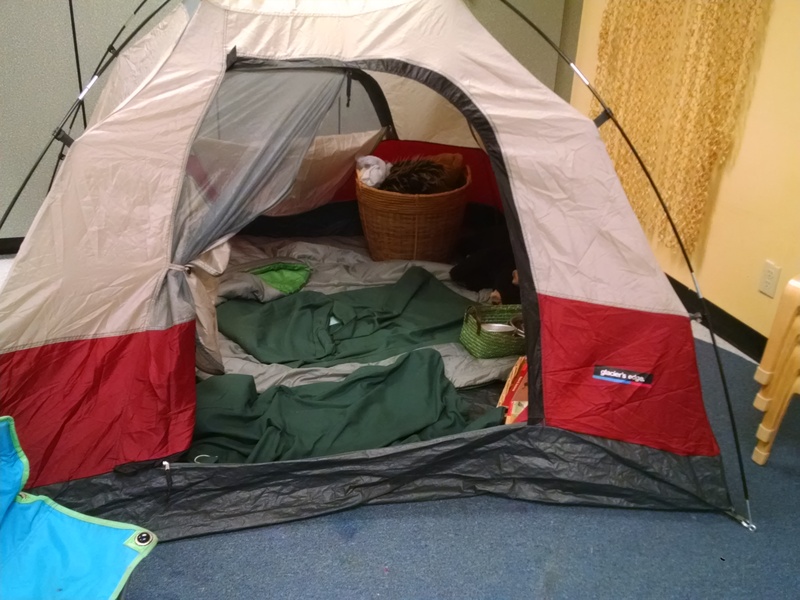 They were encouraged to think about shelter, bedding, and food in their habitats. 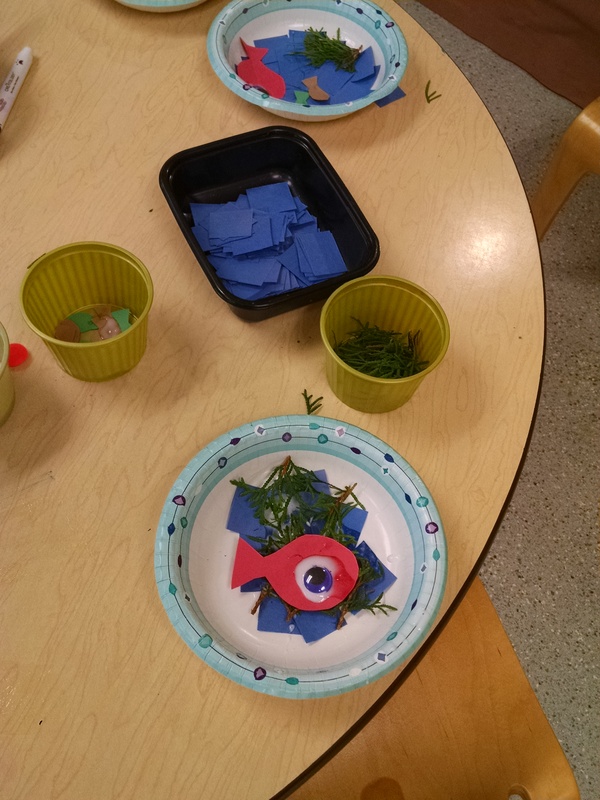 Make a fish habitat: We had paper “fish bowls,” blue paper squares for water, some plants, and paper fish. Optional: you could add aquarium rocks to this project. 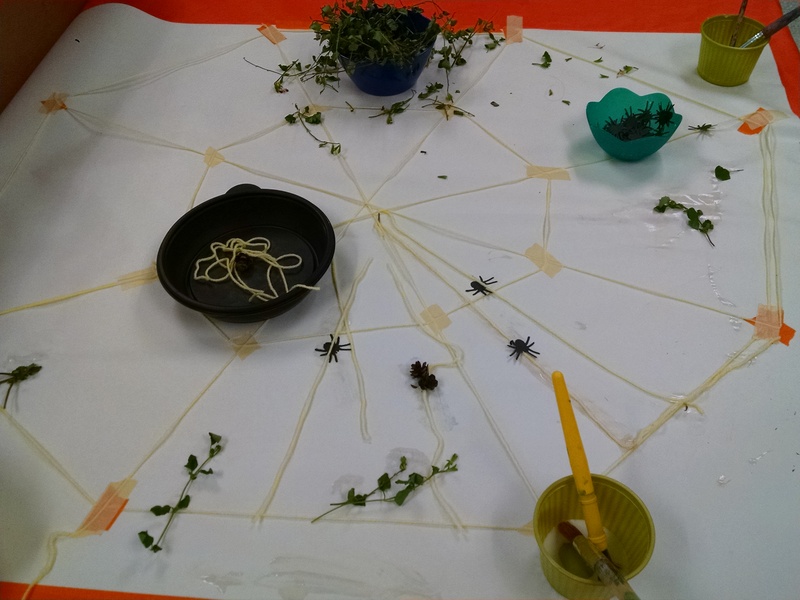 Group art: We created a spider web with tape. Kids glued onto it bits of plants, and paper spiders. Big motor: We took plastic hoops, and made spider webs with masking tape. (My original idea came from here.) We hung them with the sticky side of the masking tape facing out, and kids threw pompom “bugs” at them. If they stuck, it means the spider caught them and gets to eat them. If they didn’t stick, hurray – they got away. (More fun/less disappointing than if kids think they “failed” because bug didn’t stick.) Note: it would have been much better to use a stickier tape than masking tape… most of our bugs got away! Sorting game: We put out lots of puppets, a big blue piece of paper labelled Ocean Animals and a big piece of brown paper labelled Forest Animals, and children sorted them. I really liked the sorting mat that Little Hands, Big Work had for this activity. Maybe next year, we’ll make something like that. Water table: Filled with water, plastic marine animals, and containers to pour and scoop with. 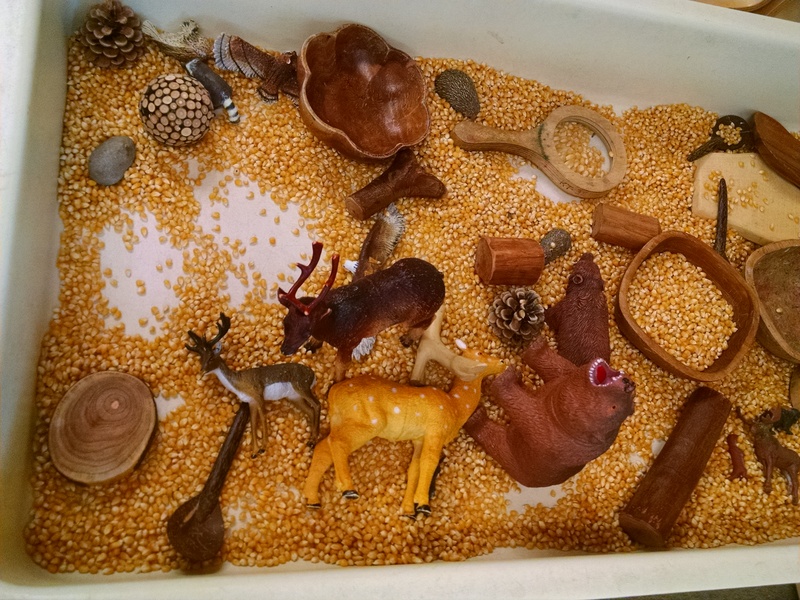 Sensory Table: Filled with popcorn kernels, assorted animals and wood bits. 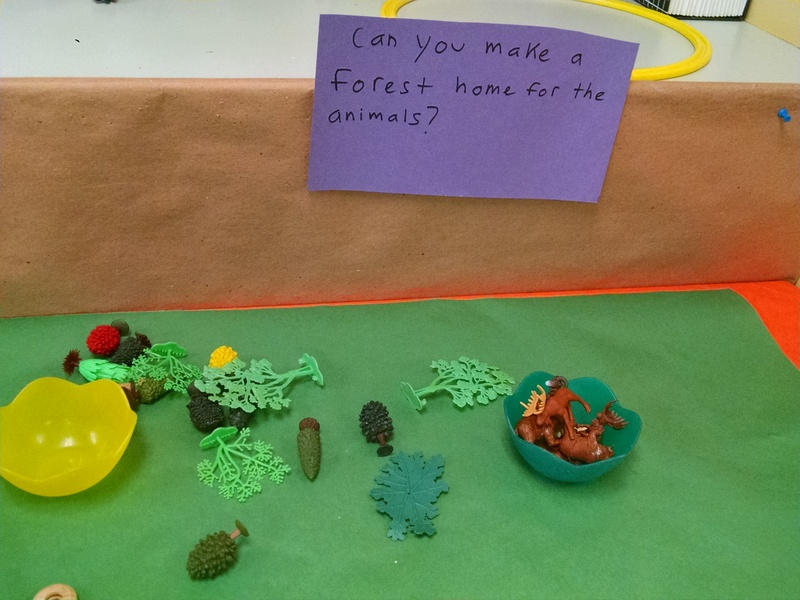 Build a habitat: Plastic animals and plastic trees to play with. We used Whose House Is This? by Gregoire in circle. It’s a fun guessing book, where it asks something like “whose house is this, dangling on a tree” and we see a branch and some green frog legs. Then you turn the page and it tells you more about the red-eyed tree frog and its home. Sensory table with multi-colored beans to hide plastic animals in. 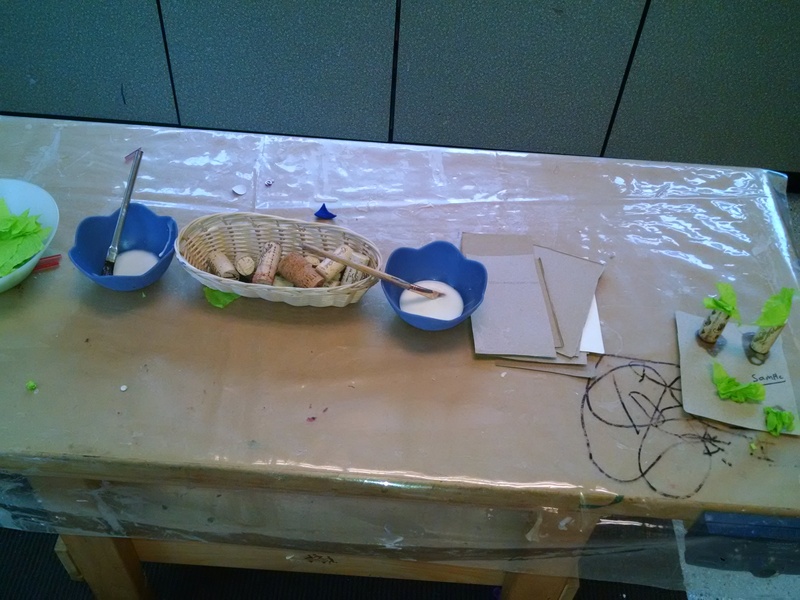 Or multiple bowls of sensory items (one with green split peas, one with brown materials, one with white) and a variety of animals so children can discover that the white animals hide best in the white materials, and so on. Or, a stuffed animal hunt/plastic animal hunt where you hide many animals in the classroom or outside, taking advantage of camouflage where they can blend in, and have kids search for them. An indoor game where children are encouraged to look at what clothes they are wearing, then find the place in the room where they would best blend in.